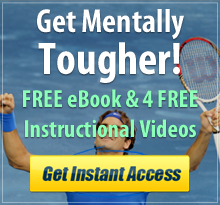 Mental Toughness has always been associated with success in tennis. Players often talk about the need for Mental Toughness, but few have figured out how to get and maintain it when they compete. In fact, many players report feelings of frustration with their inability to play as well in a match as they do on the practice court. For too many players the scoreboard has become the enemy. 1) Mental Toughness – this is the ability to control ones thoughts. It is defined by being able to play at our normal level under competitive pressure, basically, when the scoreboard is turned on. Importance in tennis… Many say that tennis is predominantly a mental sport. Some say as much as 90% of tennis is mental, but when players train, they almost exclusively train the physical and not the mental. This is a recipe for disaster. 2) Physical Toughness – this is the ability to endure pain and discomfort when training and in competition. Importance in tennis… Our sport is brutal on us physically. The constant changes of direction, need to train for long hours and lack of recovery can often leave tennis players in physical pain and discomfort. A typical tennis match has more than 600 changes and of direction and bursts of energy. It is a stop and go sport and tennis players are putting “city miles’ on their bodies whenever they compete. Action Item… Spend at least some time training yourself off the courts. Tennis has a unique rest-to-work ratio of 4-1, so make sure you are simulating the same stress on your body that it will experience when you compete. A good formula would be to train in the gym 1 hour for every 4 hours you train on the court. 3) Emotional Toughness – this is the ability to control one’s emotions and arousal levels. It requires the ability to frame the situation at hand into something positive. Importance in tennis… Tennis has unique stressors such as no coaching, no time outs, not substitutes, no time clock, and the fact that the very person you are trying to beat is also the umpire on his side of the courts. The possibility for cheating and gamesmanship exists like in few other sorts. I have witnessed, many players lose a match because of their inability to cope with these difficult situations. Action Item… Journal. Start by recalling your most recent stressful event on the court and then write it down. Then hand write a plan of action detailing what you will do if it happens again. This can be done with several different situations that make us uncomfortable. Examples would be… what if someone accuses you of cheating, what if someone makes a bad call against you, what is someone is annoying and cheers on your errors, what if the spectators are rude and annoying. These would all be great events to journal about so you can be ready for them when they inevitably happen. Remember, someone can cost you only a single point by making a bad call, but your reaction to it may cost you the entire match. Sus comentarios son muy buenos y valiosos, pero podia ser tan amable y hablar un poco mas despacito? lot of times prtevious to I coulld get it to load properly. I had been wondering iff your web hosting is OK? will sometimes affect your placement in google and can dsmage your high-quality score if ads and marketing with Adwords. Well I’m adding this RSS to my e-mail and can look out ffor uch more of your respective fascinating content. Make sure you upddate this again very soon. Good advise and lots to think about and remember!! Great blog! I love how you place the responsibility on the player while giving them the answer to the problem. Thank you.